When the Montreal Canadiens announced that reigning Hart and Vezina Trophy recipient Carey Price was going to be sidelined with a lower body injury following the team’s October 29 game in Edmonton, their fans and the collective hockey world held their breath. The Canadiens were off to another hot start, but missing Price for an extended period of time meant the potential for a major backslide was possible, especially when they would be turning to an NHL rookie in his stead. In Price’s absence, Mike Condon has become one of the best stories in the league to start the season. Undrafted coming out of Princeton, the 25-year-old parlayed a professional tryout with the Ontario Reign of the ECHL into an audition with the AHL’s Houston Aeros and then spent the 2013-14 season posting solid numbers back in the ECHL with the Wheeling Nailers. His success there led to an NHL contract with the Canadiens and after a quality year in Hamilton, he broke camp as Price’s primary backup, unseating Dustin Tokarski from the position. And he’s been filling in admirably for last year’s most valuable player since Montreal’s No. 1 went down. In 10 games this season, Condon boasts a 7-1-2 record with a 2.14 GAA and .918 SV%, the former good for 11th among qualified netminders and the latter equivalent to what former Conn Smythe Trophy winner and Vezina candidate Jonathan Quick has posted with the Los Angeles Kings this season. While his numbers still trail those put up by Price, having a reliable backup option their comfortable playing should allow Montreal to manage Price’s workload a little more throughout the season and keep him fresh for the playoffs. The Canadiens currently sit atop the Atlantic Division (and tied for first overall) with 30 points and expect to have Price back in the lineup soon, as he participated in a full practice on Wednesday for the first time since being sidelined. Condon’s ascension and strong play over the last eight games is another reminder that goaltending remains the biggest mystery on the ice, where undrafted players like the Princeton alum can come out of nowhere and shine, while top draft picks can flame out or never really get a fire lit just as easily. 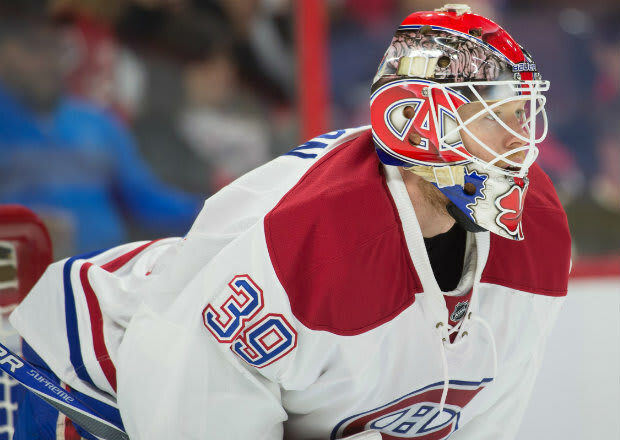 Some of his success is surely a function of Montreal’s strong defensive unit, but Condon has been turning away the pucks that get him and with each successive quality outing, his rise to being a reliable NHL backup with legitimate upside looks less like a run of good luck and more like the real thing. While Price’s impending return is obviously a positive for the club, knowing Condon can shoulder the load if need be and give them strong play on nights when Price needs a break is a major plus as the franchise looks to end Canada’s Stanley Cup drought. Canadiens vs. Islanders: Condon will be front-and-center this weekend as Montreal and New York play a Friday-Sunday home-and-home set. The Islanders have won two-in-a-row and are hoping to make up ground on the Metropolitan Division-leading Rangers, while Montreal enters the opening half off this tilt off a home loss against the Arizona Coyotes on Thursday night. Devils vs. Canucks: Cory Schneider was once the “goalie of the future” in Vancouver, but now he’s New Jersey’s top man and might feel like “the one that got away” for some Canucks fans, especially given Bo Horvat’s struggles to start his sophomore season and Ryan Miller having failed to register a win since November 2 against Philadelphia.